Guardiola: "Ready for the challenge"
Munich - Five months and nine days after Bayern stunned the football world with the announcement that Pep Guardiola would be taking over has head coach, the Spaniard was finally presented at FC Bayern Munich. Over 250 journalists from across the globe squeezed into the press conference room of the Allianz Arena to hear Guardiola’s first public address in his new role. Despite being flanked by club president Uli Hoeneß, chief executive Karl-Heinz Rummenigge and sporting director Matthias Sammer, Guardiola gave the distinct impression, largely expressed in impressive German, that he will need no help at all in this job. A cacophony of clicking cameras and excited murmuring greeted Guardiola as he calmly took to the podium to pose for pictures before the assembled press. That calmness was a sign of things to come, as he navigated his first official media duty with a style, ease and friendliness that will make reporters in Germany relish those that will follow in the coming season. Guardiola also had a startlingly simple answer to the question on everybody's lips: why had he chosen FC Bayern and why the Bundesliga? “I am here because of the history of this club; only a few clubs in the world can rival Bayern in terms of history,” before citing the opportunity to work with the present squad as a huge attraction. Guardiola was equally articulate and graceful when asked about his predecessor, who led Bayern to the . "Jupp Heynckes did a great job here and I am pleased to be taking the job after him. My aim is to change a few things, but still maintain the high level that the team has. There is always pressure on the coach, regardless of whether the team won the treble or not." Trophies will ultimately be the currency in which he is expected to deal as head coach of Europe's best team for the duration of his three-year contract, but until he leads his first training session on Wednesday, all that can wait. 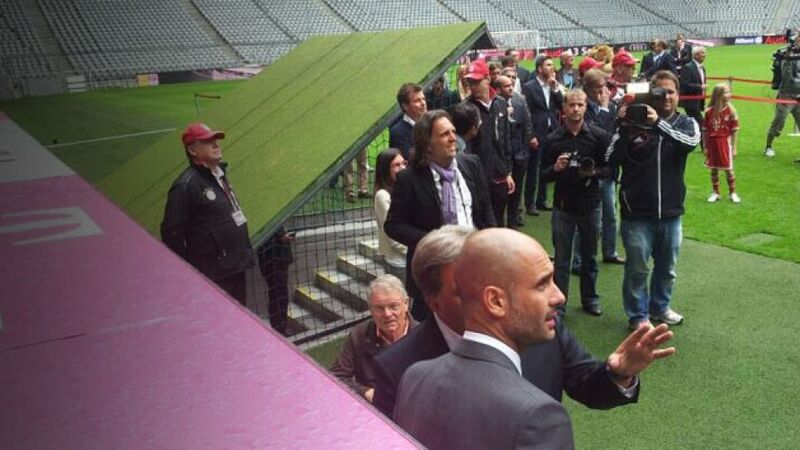 This was about first impressions, and Guardiola's in Munich could hardly have been better.